This is a name that seems to have originated in the Celebes, as the speakers of Proto Malayo Polynesian moved south from the Philippines into what is now Indonesia. It seems first to have designated the Celebes Fan Palm, Licuala rumphii, and then, as Austronesian speakers moved along the Northern New Guinea Coast and into the Pacific, the word evolved in sound and meaning from *biRu` to *piRuq (Proto-Oceanic), probably designating members of the genus Licuala in general, then *piru (Proto Eastern Oceanic) as a general term for fan and umbrella palms. In the Fiji/Rotuma area there was a further change in sound and meaning to Proto Central Pacific *viu, denoting the Pacific fan palm Pritchardia pacifica; this latter meaning was retained in Polynesia under the form *piu. 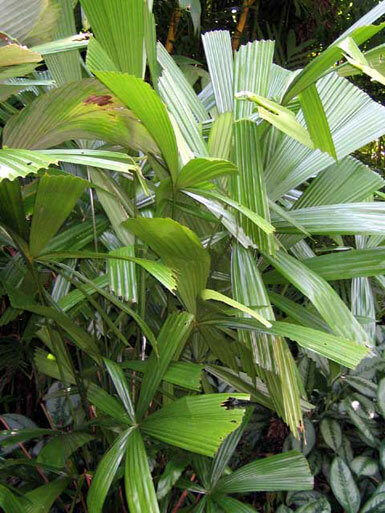 Licuala rumphii is a small rainforest palm with wide, wedge-shaped leaflets arranged in circular "fans". Some other species of Licuala have similarly "corrugated" leaves which are not divided. Pritchardia pacifica, native to Fiji and Tonga and some other parts of Polynesia, is a tall, slim fan palm with large, undivided leaves that grows to a height of up to 10 metres (there are a number of closely related species native to Hawaii). 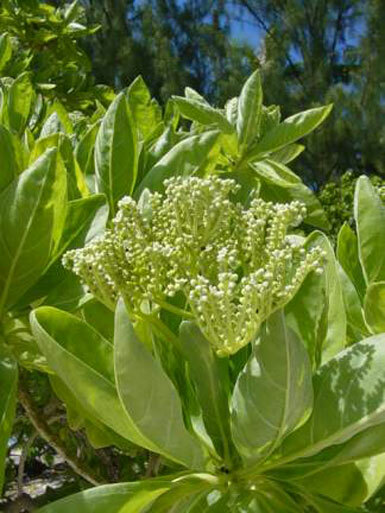 It is now grown as an ornamental tree in many places around the world. The seeds of the Pritchardia are edible, and the palm was cultivated in Fiji and Polynesia because of this and the usefulness of the fronds. Since there are no umbrella palms native to Aotearoa, it is not surprising that a derivative of the Proto Polynesian name came to refer to several species of fern, mostly with short trunks and a vaguely palm-like appearance. Three of these ferns are members of the Blechnum family (Parablechnum procerum, Lomaria discolor (photograph opposite) and Parablechnum novaezelandiae [Blechnaceae]. The fourth is Pneumanopteris pennigera, from a different botanical family (Thelypteridaceae). However the use of the same name (piupiu) in the Tuamotus for a tree which at first glance seems far removed from a palm is quite surprising and could simply be a coincidence. However, especially when in flower, the tree concerned, Tournefortia argentea, does have a configuration, in silhouette at least, somewhat reminiscent of the Pritchardia. 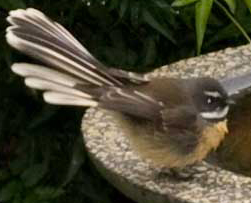 Photographs: The photograph of Pritchardia Pacifica is from the Hawaiian palm afficinado Wai'anae Steve's website. 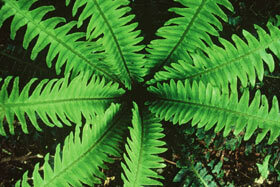 That of Blechnum procerum is by the NZ Department of Conservation on the NZ Plant Conservation Network website. 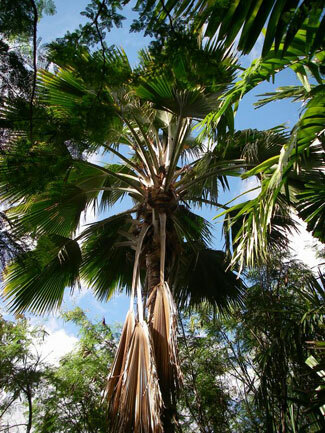 The image of Licuala rumphii is from the Palm and Cycad Societies of Australia web site, and the photograph of Tournefortia argentea is from the "Plantes et botanique" website. Further information. There is some information about Pritchardia pacifica, along with photographs, on the (U.S.) National Tropical Botanical Garden website. The US Department of Agriculture plants database has a copyright photograph of Tournefortia argentea, along with some notes about this plant.